In Rio de Janeiro, as well as in the other large cities, the industrialization and the migration from the countryside to the city modified the geography of the city. The suburbs emerged in the 1920s-30s. The favelas were the first suburbs that were developed in Rio de Janeiro ( Hermam :4). Starting in 1970s, the demand of lodging for middle and upper classes grew quickly and so people turned to the private companies. In this way, the firstcondominios fechados appeared in Rio de Janeiro. As Levy (2010:97) observes, the space is altered and frontiers are being burnt as a consequence of the globalization of the urban. However, in the past decades, the incidents of moving into a condominio fechado were the consequence of a sense of insecurity. As Rio de Janeiro developed quickly, so did the criminality; it became unsafe to use the public spaces and people started to regain their safety and freedom by moving into these isolated communities. Living in a gated community forces the public men to reproduce in a private space. (Levy 2010:103) There is a feeling of false community given by these walled spaces. ‘Gates, instead of creating communities are attracting people who prefer privacy and retreat from society’ ( Low 1997: 68) The social segregation is one of the main issues of these gated communities. Living aside this topic for the moment, Caldeira (1996:59) observes how the common characteristics of the condominios fechados involve this concept of segregation. All of these condominios fechados have armed guards and security systems so that they decide admission or exclusion of non-residents; they are designed in a introvert fashion and not towards the roads, they are isolated by big gates or surrounded by empty spaces; and nonetheless, they are private properties for collective use. We also learn from Caldeira(1996) that the condominios fechados suggest a certainstatus. Residents are creating a social distance from the others and separate themselves both consciously and unconsciously from the rest of the inhabitants of the city. ‘Os condominios negam os principios de uma vida urbana democratica.’1 (Levy 2010:105) ‘Residential segregation created by prejudice and social economic disparities is reinforced by planning practices and policing, implemented by businessmen and banks’ (Low 2001:46). What is even more striking is that mainstream media are also encouraging this new life style. There are many commercials and advertising in Brazilian media who aim to attract people in the condominios fechados and they often use ‘security’ and ‘safety’ as tools to sell the product. Some examples of this are the following condominios that are advertised through the utopia of safety : Lago : tranquilidade e vida moderna (tranquility and modern life) ; Freguesia : para voce vicer Feliz da Vida (so that you live a happy life) ; Estancia Ville : voce pode, sua familia merece(you can, your family deserves it) ; Fasol da Ilha: sua vida tambem pode ser perfeita (your life aswell can be perfect) ; Casa Propria :um final feliz para essa novela (…) com mais seguranca e qualidade de vida (a happy end for that story…with more safety and a better quality of life) ; Alphaville : viver tranquilo ( to live tranquilly). People feel an immense pressure from this both real and manufactured fear and an anxiety for their own safety that they move into these isolated places. Media rumours and true life experiences all contribute to the creation of a culture of fear in these Brazilian cities. But how safe are these condominios fechados ? In reportage of TV Aratu, we are told that according to the Secretaria de Segurança Pública there have been registered a number of 494 assaults in the gated communities in 2010 in Salvador de Bahia. Criminals seem to find ways to enter even these well secured residential areas. They enter the communities under false identities, claiming that they are workers, electricians and so on. Once they are in, they usually succeed in robbing the houses. Many crimes also occur around the gates of this residential areas, when people go home. The condominios fechados are in fact good targets for the thieves as they know that only wealthy people can afford to live in such areas. This is another reason for people to fail to feel secured even at homes. As a consequence, people update their security systems all the time, and if until recently the security man was not necessarily a professional guard, now people hire professional security men, armed and trained to deal with all kind of possible unwanted situations. In the programme Reporter Justiça there was a reportage called Normas de condominios , where people are told how to protect themselves better in the gated communities and we also find that there actually exists a faculty in Brazil that created a module that aims to teach people how to secure the gated communities and how become good managements of them. The condiminios fechadosare a popular topic in Brazil’s media. 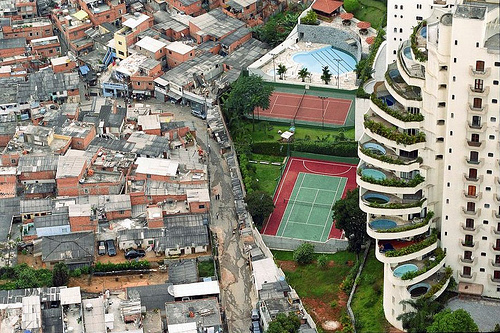 The problem of segregation is not the only negative effect of thecondominios fechados. Damaging the environment, creating discrimination, illegally occupation of public spaces in order to build new gated communities- hence violation of federal law , violation of human rights and the right of free movement and corruption are all negative consequences of the condominios fechados.